← POLL: Do you allow food/drink at the game table? As we hit the midpoint of Wine Week here on Opinionated Gamers, we harken back to a vintage that is slightly more aged. The theme of wine is not a new one in board and card games. 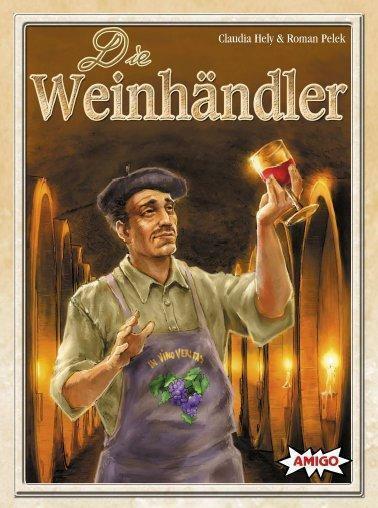 Subtitled in English as Wine Cellar Sellers, die Weinhändler is a card game based around collecting and trading bottles of wine. What do you do when you have a nice collection of bottles? Stack them into pyramids, of course (didn’t your sommelier teach you anything?) Each card represents a bottle of wine and players bid and collect sets of cards which are then arranged in a pyramid shape on the table in front of them to form their wine cellar. Players attempt to score points by matching sets of three cards in either lines or a three card pyramid shape. Players bid, using bottles in their possession, to acquire new bottles. Several rounds of bidding and placing bottle cards occur until the deck of wine cards are used up. At that point, players compare their cellars and whoever has the best wine cellar (worth the most points) wins the game. The cards consist of seven colored suits, represented by different types of wine. Each type of wine comes in three vintages, the oldest vintage earning three stars while the youngest is given a single star. Each card appears three times, making 63 cards in all. Three empty bottle cards are also present, making a total of 66 cards in the deck. Players score points for each star present on a card when it is placed in their cellar, but important bonus points are earned for lining up three cards of a similar suit (horizontal or diagonal, or in a 3 card pyramid) that either contain all the same vintage (same number of stars) or have one of each type of vintage (one star, two stars, and three stars). 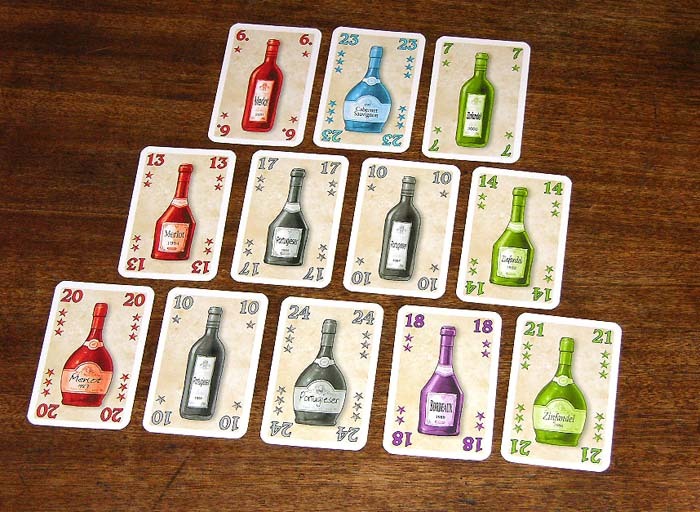 Players grow their pyramid of wine cards as the game progresses, adding cards to an upper portion only if it is supported by bottles underneath. Since cards cannot be adjusted once placed, care and planning have to be used to gain as many bonus points as possible. However, the empty wine bottles break this rule as players may use them to build their cellar and then replace them with a full, colored bottle of their choice at a later time. The wine bottles are collected by the players each round using a clever auction mechanism. Players bid for a central pool of four cards by playing bottles out of their hand. Each wine card has a numbered value, with three star wines all worth more than single-star ones. The bidding continues around the table, with players either adding cards to their bid or bowing out. (Note, players don’t have to exceed the high bid to stay in the auction, they just have to add at least one card per round.) When the auction ends, the high bidder receives all four cards in the center of the table. The second place bidder wins all the cards bid by the highest bidder. The third place bidder earns the cards bid by the second place bidder, and so on… The cards from the lowest bidder are placed into the center to form the start of the next auction. If there are fewer than four cards in the middle, cards are added from the deck to bring it up to four. Once all the players have received their cards from the auction, players may add cards to their cellar from their hand. Players with more than six cards must add to their cellar pyramid until they have six or fewer. Players can even start a new pyramid if they succeed in completing a four-level 10 card pyramid before the game ends. The game continues with new auctions, and bottle placements until the entire deck of cards has been auctioned off. Players place any remaining cards, pyramids are scored, and a winner is declared. The rules are simple to explain and understand, but playing the game well requires a good dose of hand management and planning. There is a constant need to balance cards collecting cards for playing and cards for further bidding. To reach higher scores, players need to lay out cards so they participate in multiple bonus groupings at the same time. Since cards cannot be rearranged, the temptation is to hoard cards until the perfect layout can be made. However, the hand limit of 6 cards forces players to add to their pyramid nearly every round. To make matters worse, cards in hand are needed for bidding. Save only cards you need to build in your hand and you won’t have anything left to bid. Bid too low and you will never get the better cards, but bid too high and you may soon find yourself with very few cards you can spare for the next auction. I enjoy managing the multiple competing interests of die Weinhändler. While there isn’t anything particularly groundbreaking in its mechanics, it fits a niche of games that are a small step up from simpler auction games such as For Sale or No Thanks!. It has a bit of something for everyone: hand management, bidding, and even spatial reasoning and puzzle like elements during the bottle stacking phase. As a “filler” style game, it lasts just a bit longer than other, simpler auction games, which means it doesn’t get pulled out as often. However, for times when I’m looking to bump up the complexity of an auction game just a little bit, it can be quite satisfying. I find it similar in complexity to Ra, but with easier to understand scoring. It isn’t at the level of an all time classic, but it comes in solidly as a “two-star” vintage. Ted Cheatham – This one falls in the “it is still in the collection but does not hit the table often” category. It is a nicely done game that is very reminiscent of Reiner Knizia’s Money. You have to bid the things in your hand in the hopes of collecting better things. Instead of the sets of money (in the Money game), you are building to a pyramid for bonus points. BTW, “Money” does not hit the table often either. Put this game in the interesting idea, filler category. Doug Garrett – Sometimes it takes an article like this to remind you to get a game collecting dust off your shelf and to the table once again. I agree with Matt and Ted’s descriptions and comparisons, especially the similarities to Knizia’s Money and its bidding mechanism. Though it will never be a ‘must play,’ with this reminder it’s once again off the shelf and on the ‘play this one soon’ pile. Greg Schloesser – The bidding and placement mechanisms really make this game. In order to acquire bottles you need, you must offer bottles from your current in-hand collection. This often requires you to switch your collection strategies during the course of the game when the opportunity arises to acquire even more valuable bottles and complete sets. During each bidding round, you are constantly forced to reevaluate your bidding, making touch choices on what is required in order to maintain the collection you desire. Of course, this may well change with each new card offered by an opponent during the bidding. Often, you find yourself coveting a particular set of bottles, and then struggling to offer the correct numerical value of bottles in order to insure that you can acquire those cards. For example, if I desire to acquire the cards offered by Jim, then I must make sure I bid an amount less than Jim … but close enough to Jim’s offer so that no other players squeezes in between us and scoops his bottles. This often requires me to offer bottles that I really didn’t want to lose. There are constant tough, agonizing choices throughout each bidding round. Yes, it is possible to sometimes not have the cards you need in order to make an offer which will gain you the bottles you covet. Hey, that happens. If you could always acquire exactly what you need, what fun would that be? Part of the game’s fun is making do with the resources (bottles) you have, and trying to better your position for future bids. Since players can only hold up to six cards in their hands, they are often forced to play cards into their pyramid display before they are truly ready. This forces yet more interesting and touch choices on the players. I find the game to be tense and filled with those tough choices. I am always thoroughly engaged throughout, and feel it is a true challenge and struggle to achieve my objectives. In many games, there are numerous times that I feel I am doomed, and have to plan very carefully to pull myself back into contention. For me, that is one of the marks of a good, engaging game. Just like a good glass of wine, Die Weinhändler is full-bodied and satisfies the palate. As we near the end of Wine Week here on Opinionated Gamers, we harken back to a vintage that is slightly more aged. The theme of wine is not a new one in board and card games. 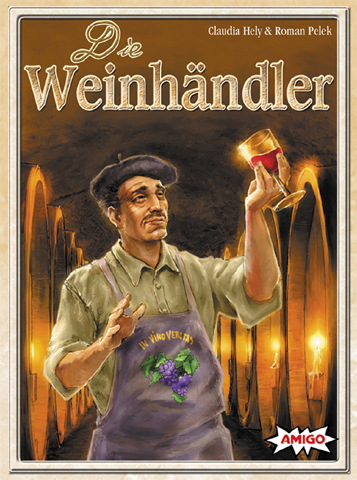 Subtitled in English as Wine Cellar Sellers, die Weinhändler is a card game based around collecting and trading bottles of wine. What do you do when you have a nice collection of bottles? Stack them into pyramids, of course (didn’t your sommelier teach you anything?) Each card represents a bottle of wine and players bid and collect sets of cards which are then arranged in a pyramid shape on the table in front of them to form their wine cellar. Players attempt to score points by matching sets of three cards in either lines or a three card pyramid shape. Players bid, using bottles in their possession, to acquire new bottles. Several rounds of bidding and placing bottle cards occur until the deck of wine cards are used up. At that point, players compare their cellars and whoever has the best wine cellar (worth the most points) wins the game. This entry was posted in Reviews and tagged AMIGO, Claudia Hely, die weinhandler, Roman Pelek. Bookmark the permalink. It’s interesting that this is our third wine game reviewed this week and in each of them, players can “buy” things using the wine itself. Given that Die Weinhändler is a set collecting game, that’s not too surprising, but it is notable for the first two, which are economic games. Vinhos even includes cash, but still requires you to use booze to buy additional actions. Do sommeliers secretly wish for a barter system to replace filthy lucre? Die Weinhändler was Hely and Palek’s followup game to their collaboration on the most excellent Santiago. Those are the only two games they designed together; in fact, they are the only games on Claudia Hely’s resume. Roman Pelek only has one additional design to his credit, the very good (and much underrated) Shanghaien, co-designed with Michael Schacht. Given the quality of these games, it’s a shame that nothing further has been heard from either of them. I’ve never had the chance to play Die Weinhändler; in fact, I’ve never even seen it being played. Matt’s review makes me want to try it out. I love games where you bid with the things you’re trying to collect (like Katzenjammer Blues and Money), as they usually provide some interesting valuation problems. The auction system in Die Weinhändler sounds clever. I have no idea if I’ll have any access to this game anytime soon, but it is now on my radar. Thanks, Matt!